V1: Talking about separation of the upper and lower body, specifically the "rotational separation", the advice is too often to "turn the feet under the stable upper body". The assumption is as if the upper body is anchored in "the ether" and refuses to rotate, even as we rotate the lower body with boots, skis and everything. In fact, this is one of the most common problems of skiers everywhere: rotating the upper body and following the skis into the turn. Of course, we know there's no ether and that the upper body is much too easily rotated. The opposite way of thinking is that we tip the skis on edge and then their design (sidecut) interacts with the snow and this is what turn them. In this frame of reference, the upper body would very much like to turn and follow the skis (remember, a common problem with skiers) and we have to actively resist that tendency and counteract it. So, in the image above, we see number 3 not as a movement, but as a result of tipping the skis on edge and balancing on them (1 and 2). Thus, to maintain separation, we need to counteract that: number 4. To understand where the "stable body" notion comes from, consider that when forcefully twisting and pivoting the skis, it's much to easy to leverage against the upper body's inertia. In this case, it's easy to feel as if the upoer body is "anchored" and we rotate the lower body. When carving though, it is clear that the skis turn because of the interaction with the snow and then the upper body must be stopped from following them by counteracting. Just some thoughts on philosophy of skiing - y'all racer types can do without ;) . A big difference between several approaches to skiing appears to be due to an upper vs lower body "anchoring" philosophy. Basically, if you think that the upper body is somehow anchored in the ether and does not want to turn, then steering and pivoting appear as central concepts, simply because you then "turn your legs against an stable upper body". The upper body is the anchor. If, on the other hand, you think that the ski-snow interaction turns the lower body, then you're most likely to think of the upper body moving counter to this influence, to appear stable and not lean into the turn or turn with the… turn, if you want. The difference for me is one of propensity for carving. The ski-snow interaction is strongest when carving and weakest when pivoting the skis over the surface of the snow. If this interaction is generally weak, given a propensity for skidding and pivoting turns, then an "upper body is anchored" philosophy is more common. If on the other hand, carving is the preferred turning method, then quite obviously, the ski-snow interaction is very strong and it is obvious that this is what turns the lower body (i.e. the bent ski gliding on tracks), not some skier action. The skier's lower body efforts merely allow this turning to occur unimpeded and follow the skis as they turn. 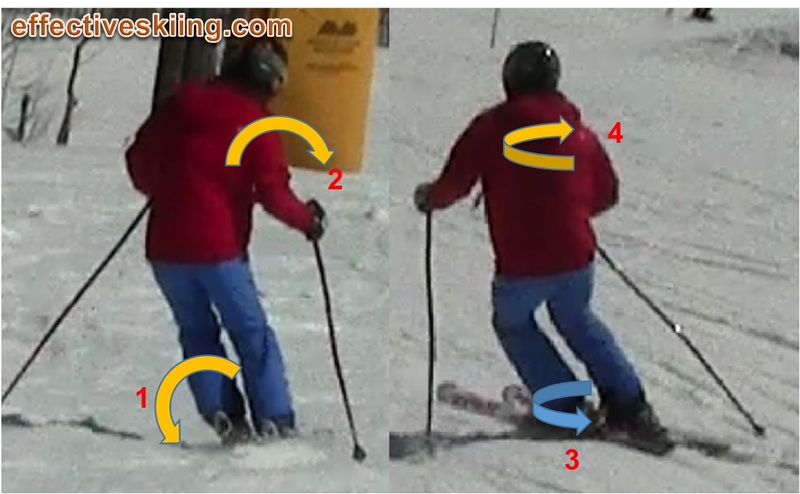 In this case, the upper body is generally seen as wanting to follow (since it's not anchored) and needing special movements to prevent it following the lower body in both leaning into the turn and rotating with the turning skis. Both approaches are valid, in their own circumstances. Certainly in the air or unweighted, the upper body is much heavier than the lower body and thus any lower body redirection or rotation would be executed against the upper body's inertia. While if you are carving a lot, you know that the bent ski turns and thus that provides the anchor that the upper body must be reacting to! If you want to read a further detailed analysis of this, very relevant to expert skiing and racing, continue with this higher level talk: Flexing and upper body anchoring. Viewed 376 times ( | Print ) this page.